Costa Rican defender Maria Elizondo,left, is tackled by Canadian striker Jayde Riviere during action in the opening match of the CONCACAF U20 Women's Championships at the Ato Boldon Stadium, Couva yesterday. Canada won the match 3-1. The CONCACAF Women's Under-20 Championship began yesterday with Canada playing Costa Rica in the opening match of the tournament which kicked off at 4 pm at the Ato Boldon Stadium, Couva. 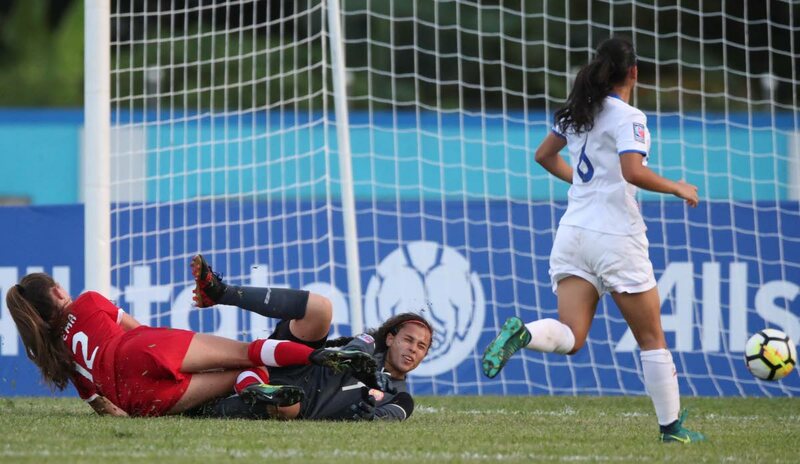 Canada's Jordyn Huitema inspired a comeback victory for her team as they defeated the Costa Ricans 3-1. In the first Group A game, Costa Rica's captain, Gloriana Villalobos, almost scored the opening goal of the tournament with her curling effort in the 24th minute sailing over the crossbar. 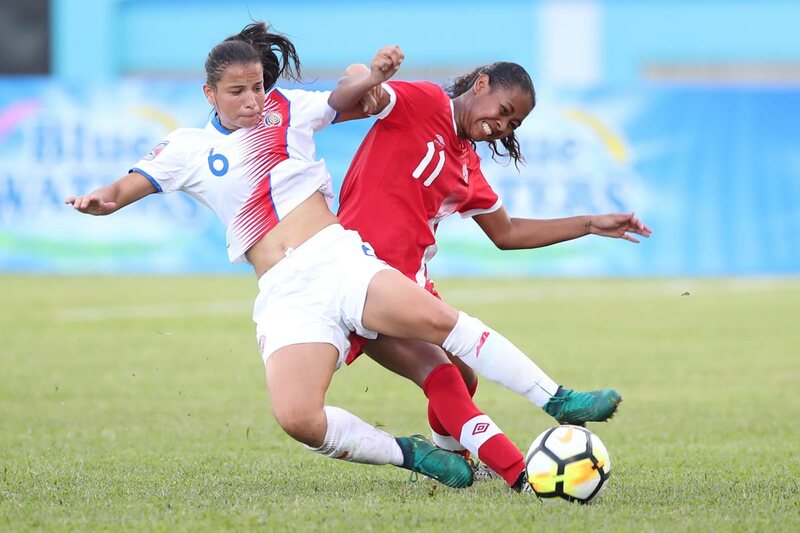 Four minutes later, Costa Rica's forward, Catalina Estrada, capitalised on a defensive error by the Canadians and made no mistake when she found herself one on one with the goalkeeper and gave her side the 1-0 advantage. The score remained 1-0 in favour of the Costa Ricans, however, it was the Canadians who came out the dressing room with a point to prove. In the 50th minute, Canada's Jordyn Huitema, followed onto a long ball inside of the opponents 18-yard box and lobbed the onrushing goalkeeper. The Canadians were then awarded a penalty kick after the left wing back, Emma Regan, was brought down after bursting into the penalty area. Costa Rica's goalkeeper, Fabiana Solano, saved the initial penalty and the following tap-in was ruled offside by the officials. Canada then got the go ahead goal in the 57th minute when the ball was brilliantly worked down the left flank and whipped across by midfielder Sarah Stratigakis, finding her captain, Gabby Carle, in the box as she finished from close range. Huitema doubled her tally in 66th minute and gave the Canadians some breathing space when she powered her way through Costa Rica's defence to make the score 3-1. Canada's captain Carle was awarded the Player-of-the-Match award for her performance. The top three teams in the eight-team CONCACAF tournament will qualify for the 2018 FIFA Under-20 Women’s World Cup, France, in August. Rylee Foster (GK), Emma Regan, Ashley Cathro (Jessica Lisi), Julia Grosso, Hannah Taylor, Shana Flynn (Teni Akindoju), Sarah Stratigakis (Caitlin Shaw), Gabby Carle (C), Jayde Riviere, Jordyn Huitema, Maya Antoine. Fabiana Solano (GK), Maria Paula Salas (Fabiola Villalobas), Maria Paula Coto, Maria Paula Elizondo, Mariela Campos (Fernanda Sanabria), Gloriana Villalobos, Kennly Villalobos, Stephannie Blanco, Priscila Chinchilla, Catalina Estrada, Yaniela Arias. Reply to "Huitema doubles up as Canada trounce Costa Rica 3-1"